American journalist Byron Pitt got married to the wife, who is also associated with the same profession. The Baltimore native is a well-known ABC’s personality, who is an active journalist and author. He is a multiple Emmy Award-winning journalist and news expert with over 20 years of experience, acknowledged for his thoughtful storytelling. The veteran journalist was born on October 21, 1960, to parents Clarice and William Pitts in Baltimore, Maryland. He grew up in a working-class neighborhood, raised by a single mother. He, as a child, had a debilitating problem of stuttering and also was illiterate until he was 12 years old. Interesting: Peter Greenberg Bio: A Single Man Or, Married Man With Wife And Family? Marking the occasion of the Fathers day in June 2018, he uploaded a picture of his mother dedicating the day to the single mothers. He added that his brother, Mac is a great dad in significant part because of her. He graduated from Ohio Wesleyan University in 1982 with a degree in Bachelor of Arts in Journalism and Speech Communication. He is very famous for his voice and storytelling skills. He has showcased that talent in his memoir, Step Out on Nothing: How Faith and Family Helped Me Conquer Life’s Challenges. Byron started his television career as a weekend sports anchor at CBS-affiliated WNCT-TV in 1983. Later, he became a military reporter for NBC-affiliated WAVY-TV and a reporter for WESH-TV. 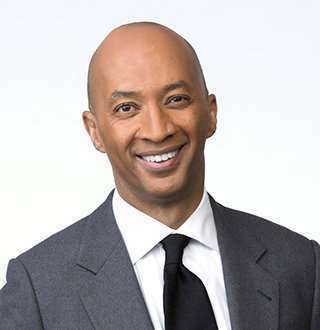 After moving to Washington, D.C. in 1997, he took the responsibility as a correspondent for CBS Newspath, the 24-hour affiliate news service of CBS News until 1998. On the May of the same year, he was named as CBS News correspondent and initially served in the Miami, Atlanta bureaus and New York City till 2001. Byron’s bio includes his coverage of breaking stories and news, including coverage of Iraq war, Hurricane Katrina, the war in Afghanistan, the military buildup in Kuwait, the Florida fires, the Elian Gonzalez story, the refugee crisis in Kosovo and much more. Byron served as a chief national correspondent for The CBS Evening News and contributor to the Newsmagazine 60 minutes before joining the ABC News in March 2013. He currently co-hosts the late-night television's news program, Nightline. Byron has won numbers of his awards for his contribution in the journalism field. He won multiple Emmy Awards for his exclusive coverages and also won a National Association of Black Journalists Award in 2002. With his successful, prolonged career, Byron currently enjoys an impressive salary which reflects in his remarkable net worth. As a reporter on ABC network, his salary ranges from $99K to $106K. Similarly, the earnings from the various renown networks also contribute his net worth. For his more than three decades of experience on journalism, he undoubtedly enjoys the gigantic net worth, which stands over $5 million. Talking about Bryon, this ABC News correspondent is happily married to the love of his life, Lyne Johnson Pitts, who is also a TV executive and journalist. However, the exact date of their marriage remains undisclosed. Moreover, the couple is blessed with three beautiful children: Christina Pitts, Brittni Pitts, and Angela Pitts. Furthermore, he always keeps mentioning how his family supported him to overcome all the difficulties he faced in his life. In his memoir Step Out On Nothing, Byron describes how, with faith and the help of family and friends, he overcame illiteracy to become an award-winning correspondent holding one of the top jobs in broadcast journalism. Further, Byron keeps flaunting his love for his spouse and children’s on social media. Back in 2010, Byron tweeted mentioning that he came back from a long weekend that he spent away for his wife’s birthday. Furthermore, he spends quality time with his family and friends whenever he has time. Back in July 2017, he Instagrammed a video enjoying a family reunion where he expressed that his heart was full of joy and pride to be together with his family. We are already familiar that Byron Pitts was raised by his single mother, Clarice Pitts. For seventy-seven years, she was the one in charge of her family. Byron’s mother was a social worker by profession whose vibrant personality, and a great sense of humor always appeared as a father figure for Byron. Growing up, he saw his mother struggling to take care of the entire family without any complaint in her face. But when she started suffering from Dementia, Byron witnessed her mother losing her personality which was an extreme pain for him as he had never seen his mother that way. Before leaving the world in 2011, for four years, her family was her army who took care of her. Byron’s older sister, Saundra made a caregiving schedule where each of her brothers and sisters was assigned with a task to take care of their mother, a week at a time. Sadly, she did not survive for too long but as she left, the family bond grew even stronger and Byron thanks his mother for her last gift to the family. James Roday Reel Wife & Real-Life Girlfriend Married Another Actor! Why?